At first the signs were subtle. Their 19-year-old son seemed irritable and was sleeping significantly more than usual. His parents assumed it was the result of his busy schedule. Then they got a call from the dean at his college. Their son had been transported to the local hospital with a blood alcohol level of .245. They learned this wasn’t the first time their son had been drinking heavily. He confessed that the pressure of keeping up with his classes, sports commitments, and making new friends often left him feeling overwhelmed, anxious, and depressed. This scenario has become exceptionally common as more young people in the U.S. attempt to deal with stress and psychological challenges by self-medicating with alcohol and drugs. For the children of high net worth families, a study conducted by researchers at Columbia University found that these negative coping mechanisms occurred more frequently. Children and young adults from families of higher socioeconomic status had a higher incidence of alcohol use, binge drinking, and substance use, as well as other maladjustment behaviors including lying, cheating, theft from parents and peers, destruction of property, and violence toward others. Dr. Cheryl Rampage, a licensed clinical psychologist and executive vice president at The Family Institute at Northwestern University, found that anxiety among affluent children is 25% to 30% higher compared to teens of other socioeconomic backgrounds and 20% are diagnosed with clinically significant depression, an incidence 3 times the national average. Other researchers have found that in high school students from middle and upper class families, depression, anxiety, suicidal thoughts, loneliness, and physical manifestations of mental health issues, such as headaches, stomachaches, and pain, occur at twice the rate of national averages. 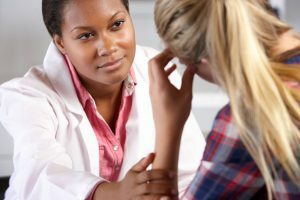 To lower the risk that teens and young adults may experience serious depression, anxiety, and alcohol and substance use disorders, it is important for parents to regularly express to their children that they are unconditionally loved and valued and that this love and value are not based on achievement. Combating perfectionism is another piece of the puzzle. No child or young adult can consistently achieve perfection without paying a high psychological, and in many cases physical, price. Parents should encourage children to set realistic goals that result from a child’s own desire to achieve rather than parents’ expectations of what achievement should look like. When teens and young adults do face issues with mental health and substance misuse, getting access to the best treatment as quickly as possible is essential. A health advisor can be an effective resource, providing confidential, expedited access to high quality mental health care services worldwide. Advisors also offer one-on-one support and guidance to help navigate the mental health care system and connect families with the care they need.